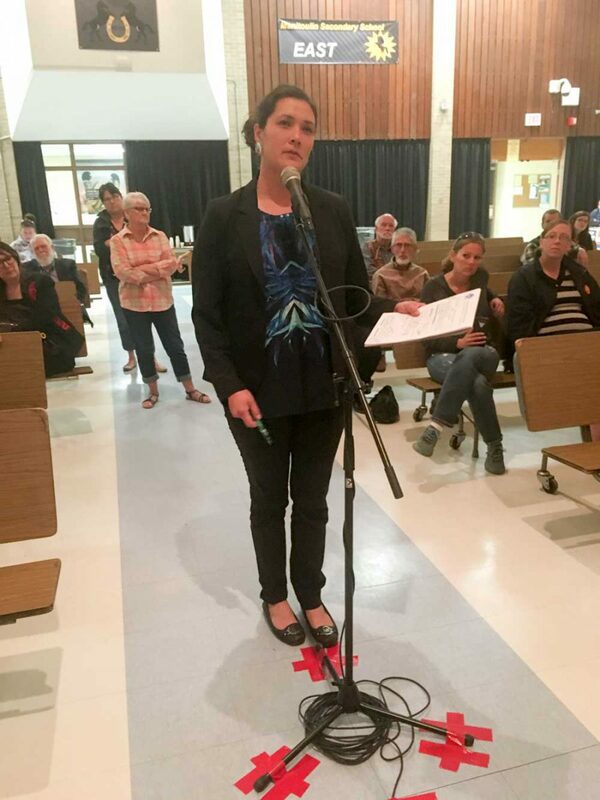 EDITOR’S NOTE: The following are the questions from the floor from the May 15 All Candidates’ Night held at Manitoulin secondary School and hosted by this newspaper. Four of six candidates were in attendance: Justin Tilson of the Green Party, Tommy Lee of the Northern Ontario Party, Michael Mantha of the NDP (incumbent) and Charles Fox of the Liberal Party. Larry Killens of South Baymouth asked the candidates to list their top three problems, either local or provincial, as they see them, asking them to consider education (Mr. Killens is the Manitoulin trustee of the Rainbow District School Board). Liberal: Charles Fox said he sees the lack of employment and resource development as problems in the riding. In terms of education, Mr. Fox reminded the audience that First nations people only receive 50 percent of the funding that their non-First Nation neighbours receive. He added that better partnerships need to be developed between the federal and provincial governments. NDP: In terms of education Michael Mantha said he would eliminate the EQAO testing and acknowledged the need to adjust First Nation funding in education to fix the shortfall. His top three issues for the riding are roads, hydro and healthcare, he said. “Why the government decided to privatize the roads system is beyond me,” he said of highway contractors, adding that if they aren’t doing their job, the contractors need to be fined. “Why did the government decide to sell off one of our biggest assets?” he asked, referencing the sale of Hydro One. Ontarians said no, yet the government has sold 60 percent of its shares so far. Mr. Mantha said the NDP has a plan to get those shares back by using the dividends accrued through the remaining 40 percent shares to buy back stock. Northern Ontario Party: Tommy Lee spoke of the decline in population, referencing the White River sawmill that is booming but can’t find enough people to fill shifts. Mr. Lee also spoke of the Algoma Central Railway that was recently cut, yet the Liberal government poured millions into GO transit. Green Party: Justin Tilson spoke of permaculture, “a way of living based on what we can do here with the resources we have. Right now, the government gives those resources away for free,” he added, noting Norway’s model of companies paying high fees for use of resources. On the education front, Mr. Tilson said the Green Party would eliminate all Catholic school boards. “No other religion has that,” he said. Northern Ontario Party: “We believe the budget needs to be balanced and can’t go on running a huge deficit,” said Mr. Lee. If the bill was re-tabled, he said he would poll his constituents and do what they thought right. “PSWs are leaving hospitals and homes because they’re exhausted.,” he said. Mr. Mantha asked the audience how many people can do their morning routine in six or seven minutes. “None of you,” he said. Liberal: “There’s no such programming in our communities, but we would welcome it,” Mr. Fox began. “I’d certainly like to examine that questions and take it a step further. Can it be improved?” he asked. Marge Wilton of Dominion Bay told the candidates that 79 days ago she was diagnosed with heart disease and told she needed a triple bypass. It was now a matter of waiting. Liberal: Mr. Fox said he was a survivor of heart surgery, but had to go to Hamilton to get it. He said he would like to see that surgery available in the North. Remote First Nations, he added, don’t get proper treatment. NDP: Mr. Mantha told Ms. Wilton the NDPs would immediately inject $960 million into the hospital system to get it caught up after 10 years of freezing. After 10 years, the NDP would inject another $19 million into the hospital system. “For 10 years hospitals have been underfunded,” he said. Northern Ontario Party: Mr. Lee said the NOP realizes the gross inequality between the north and south, not only in terms of health care, but transportation and other issues too. Green Party: Mr. Tilson told Ms. Wilton he was sorry she was ill and wished her all the best before explaining that the Greens support increased health care funding. However, he said, the party’s focus is on spending more on preventing poor health before it happens. “An ounce of prevention is a pound of cure,” he said. Mike Wilton, also of Dominion Bay (and spouse of the previous questioner), asked the candidates what they would do to stop the Line 5 gas and oil pipeline that flows under the Straits of Mackinac. Green Party: “It blows my mind that we have a pipeline running through the Great Lakes,” Mr. Tilson said. “I would advocate with a lot of passion to remove it from the Great Lakes,” and to find alternate transportation for the oil. NDP: Mr. Mantha said the Great Lakes are under a lot of threat and greater engagement is needed, especially with First Nations. Going forward, Mr. Mantha spoke of the use of roads or trains for transportation of oil. “It needs to start with a revision of the Environmental Bill of Rights,” he added. Zack Nicholls of Little Current asked the candidates if their parties would support changes to the Cosmetic Pesticides Act that would allow municipalities to govern their own lands when it comes to allowing or disallowing the spraying of herbicides and pesticides. Liberal: “When you look at the effect of any toxic substance and the effect on the land, it affects us,” Mr. Fox said. NDP: Mr. Mantha said he was proud to be involved with the Traditional Ecological Knowledge (TEK) Elders and the Manitoulin group, for whom he has introduced a petition in the legislature. Mr. Mantha said the only reason the government allows this is because it’s cheaper and easier. Green Party: Mr. Tilson said he realized the downside of having municipalities make those decisions because it creates a patchwork of bylaws that makes it impossible for companies and ministries to navigate. However, he said, if herbicides weren’t applied it would in turn mean more jobs for people to do the same job manually. Margaret Van Camp of White’s Point asked Mr. Fox why he’s a Liberal and what he’s most pleased with in terms of Kathleen Wynne’s accomplishments. Mr. Fox said he first approached the First Nation leadership of the riding to get their blessing and with it, he let his name stand. Mr. Fox said he was pleased that Ms. Wynne approved the hook up to the grid for Northern remote communities to improve Internet access and said he sees Truth and Reconciliation action under the provincial Liberals and feels they are on the right course. “To begin to develop those bridges between Indigenous and non-Indigenous, I believe in that,” he added. Heather Wilson of Espanola asked about the parties’ stances on the Ring of Fire. Green Party: Mr. Tilson said his party agreed with delivering resources, but in consultation with all stakeholders, not just wealth investors, and with an eye to the long term saying that Ontario did not need an ecological disaster such as can be found in Alberta. Mark Hamalainen of Little Current asked how the parties can prepare the province for a future of automation and artificial intelligence which will likely mean a loss of jobs in some sectors for this province’s residents. With guaranteed income, the expensive overhead of systems such as Ontario Works is removed. NDP: Mr. Mantha said that the province does need to prepare for the future and suggested a restructuring of schools to educate, attract and maintain youth in high tech sectors. Sandy McGillivray asked the candidates how their parties would balance the needs of the patients with the morals of the doctor when it comes to medically assisted death. Liberal: Considering the suicide epidemic facing some Northern reserves, Mr. Fox said he did not support medically assisted death. NDP: Mr. Mantha said he believed that those who wish to die in that way are entitled to it, referencing a constituent and his battle with failing health. Wikwemkoong Ogimaa Duke Peltier asked if the candidates’ parties were committed to implementing the United Nations Declaration on the Rights of Indigenous Peoples and how they would do it. Green Party: “In principle, I’m with you,” Mr. Tilson said. 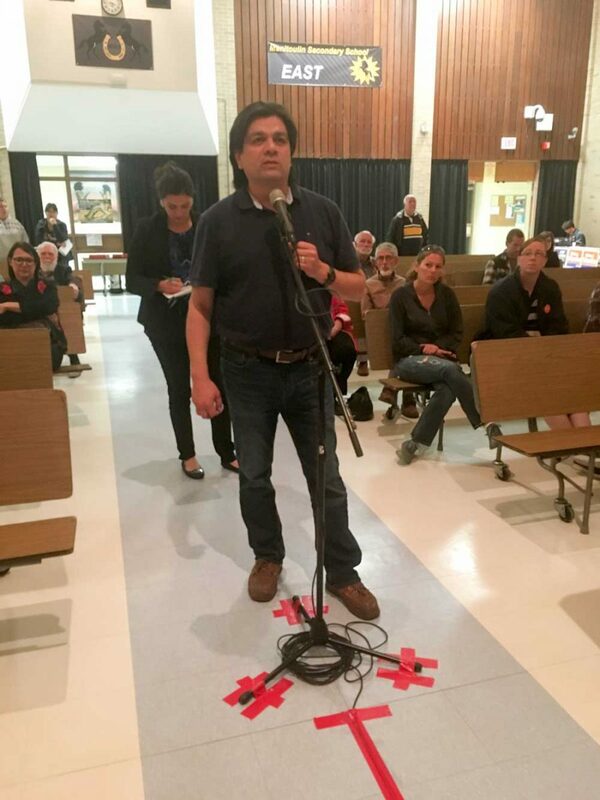 Northern Ontario Party: Mr. Lee admitted the NOP should have more Indigenous people in the party, and the party needs to address Indigenous concerns in its platforms. Wiikwemkoong Ogimaa Duke Peltier challenged the candidates over whether their parties support the UN Declaration in on the Rights of Indigenous Peoples. NDP: Mr. Mantha said their federal leader, Jagmeet Singh, has said he would fully implement the declaration. Mr. Fox said he knows that a statement in the report of the Truth and Reconciliation Commission refers to the United Nations Declaration on the Rights of Indigenous Peoples and that both federal and provincial governments need to implement it, noting that the province is moving that way. M’Chigeeng First Nation Ogimaa Linda Debassige asked how the candidates’ parties propose to adjust the jurisdictional gaps between the province and the federal government, noting that the natural resources have been a major revenue pot that funds government initiatives. All this, the chief added, despite the Crown’s duty to the treaties. NDP: Mr. Mantha referenced the NDP policy book on adjusting funding gaps and said he would be pleased to speak with Ogimaa Debassige following the meeting. Linda Bowerman of Sheguiandah spoke of her recent trials and tribulations in the health care system and asking of the candidates would support government funding for naturopathy. NDP: Mr. Mantha spoke of the NDP policy that states that libraries would receive $3 million each year. Liberal: “Most definitely,” Mr. Fox said. Northern Ontario Party: Mr. Lee said it wasn’t in the NOP platform, but if it was the will of the constituents, then yes.